The people of the Diocese of Niagara have formulated our vision which in turn speaks to and drives the development of our Anglican Community. "Where there is no vision, the people perish...” so saith the King James Version of Proverbs 29:18a! Other translations and paraphrases sound less dire. “If people can’t see what God is doing, they stumble all over themselves..." The Message or “the people get out of hand...” The Jerusalem Bible. But none recommend living without vision; but what blessings unfold where there is vision? We, as the Diocese of Niagara, trust in the God of mission. We believe, therefore, that God is doing powerful things in the world, around, amongst, within and, at times, in spite, of us. 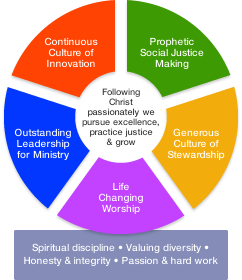 Since 2008, we have been guided by a particular Vision for Ministry calling us to follow Jesus, the Christ, passionately. Baptism initiates us into this adventure and deputizes us to work with God and so many others to pursue excellence, practise justice and grow. Responding to that call and nurtured by the values of spiritual discipline, valuing diversity, honesty and integrity, passion and hard work, we flower in life-giving ways. We are, consequently, more boldly prophetic as partners in social justice-making, more generous and innovative, engaged in life-changing worship and being raised up as leaders for and in God’s ministry. We will still stumble on the way, but we are delighting in finding, afresh, a vision-guided Way. Click on different places on the vision graphic to learn more. No upcoming events at this time in vision values.